RMIT University researchers have brought ultra-fast, nano-scale data storage within striking reach, using technology that mimics the human brain. The researchers have built a novel nano-structure that offers a new platform for the development of highly stable and reliable nanoscale memory devices. The pioneering work will feature on a forthcoming cover of materials science journal Advanced Functional Materials (11 November). 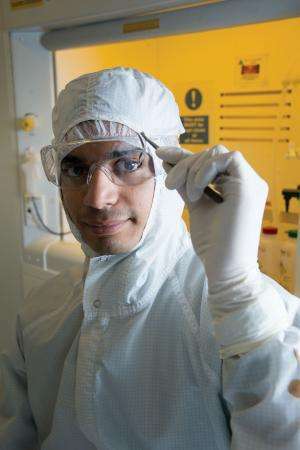 "The thin film is specifically designed to have defects in its chemistry to demonstrate a 'memristive' effect – where the memory element's behaviour is dependent on its past experiences," Dr Sriram said. "With flash memory rapidly approaching fundamental scaling limits, we need novel materials and architectures for creating the next generation of non-volatile memory. "The structure we developed could be used for a range of electronic applications – from ultrafast memory devices that can be shrunk down to a few nanometers, to computer logic architectures that replicate the versatility and response time of a biological neural network. "While more investigation needs to be done, our work advances the search for next generation memory technology can replicate the complex functions of human neural system – bringing us one step closer to the bionic brain."